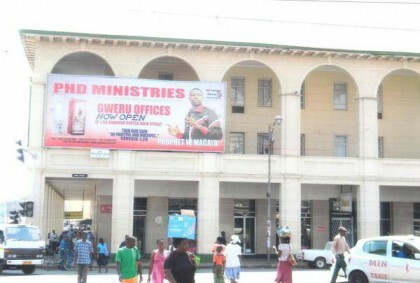 The Prophetic Healing and Deliverance Ministries (PHD) has opened offices in Gweru at Bahadur Centre, arguably the Midlands capital's busiest shopping complex. This morning the offices, situated at Shop Number 35, looked more of a commercial shop than church offices. Gweru residents dashed to buy items such as anointing oil, books, wristbands, reminder bracelets, t-shirts, jackets and more. The items range from $1 for the books, to $25 for the jackets. Yesterday a large banner was erected outside Midlands Hotel to inform those who want the products, of the new office.